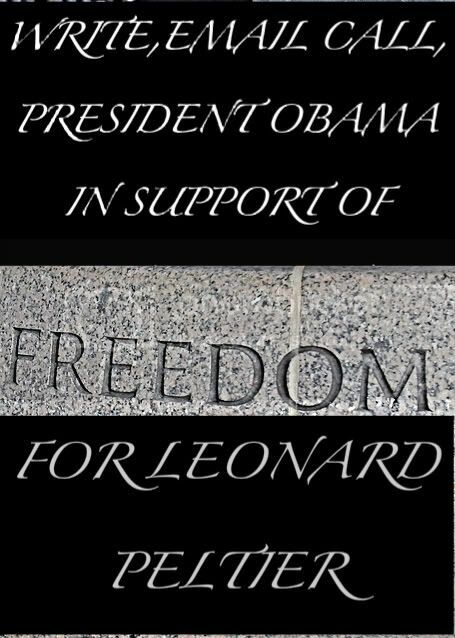 It is with a great sense of urgency that I ask you to free Leonard Peltier. Peltier was recently attacked, was prevented from speaking to his attorney on January 23 after he was attacked, and he is now just permitted one phone call every thirty days. Honestly Mr. President, this does not surprise me. Before proceeding, I honor you for and am grateful beyond words for the immediate changes you have made. Mr. President, these truths should be factors in your decision in my opinion: the historical context of the Indian Boarding Schools which closed in the early 70’s, and the Forced Sterilizations of Indigenous Women in the mid 70’s. Both are not separate from being major contributing factors to the circumstances at the time of Peltier’s false arrest. They, in conjunction with the obvious genocidal colonial practices that preceded Indian Boarding Schools and Forced Sterilizations, created the violence. Correspondingly, you may not know of the CIA’s influence over some journalism and book publications in academia; consequently, I believe that should also be a factor in your decision to free Leonard Peltier. Amnesty International is today calling on President Clinton to grant Leonard Peltier presidential pardon before leaving office. Leonard Peltier, a Native American Indian, has been in prison for 23 years for the murder of two Federal Bureau of Investigation (FBI) agents. Amnesty International believes that the evidence that Peltier shot the two FBI agents is far from conclusive. One of the organization's pivotal concerns was that his extradition from Canada was on the basis of a testimony by an alleged eye-witness who was coerced by the FBI into making false statements. In a recent public hearing in Toronto, Canada, Myrtle Poor Bear reasserted that her original claim -- that she was Peltier's girlfriend and that she saw him shoot the agents -- was false, and was a result of months of threats and harassment from FBI agents. She had also said that she had been 80 kilometers (50 miles) away from the scene at the time of the shooting. Amnesty International has repeatedly voiced serious concerns over the fairness of the legal proceedings which led to Leonard Peltier's conviction and sentence, and believes that political factors may have influenced the way in which the case was conducted. Key witnesses were banned from testifying about FBI misconduct & testimony about the conditions and atmosphere on the Pine Ridge Reservation at the time of the shoot-out was severely restricted. Important evidence, such as conflicting ballistics reports, was ruled inadmissible. Still, the U.S. Prosecutor failed to produce a single witness who could identify Peltier as the shooter. Instead, the government tied a bullet casing found near the bodies of their agents to the alleged murder weapon, arguing that this gun had been the only one of its kind used during the shootout, and that it had belonged to Peltier. Mr. President, every time I have heard about the FBI agent who wrote “American Indian Mafia” and has written in favor of keeping Peltier in prison, I think about this. The article states that it’s not specifically pertaining to “American Indian politics,” but does explore what it calls “close connections” with the CIA’s influence over some journalism and book publications in academia with the fact that the “victors have been writing the history.” That to me, Mr. President, is an indisputable fact. What’s more, is the reason "victors have been writing the history" is to acquire Tribal Lands and the natural resources on them. Mr. President, have you ever heard of Alex White Plume? Alex White Plume, a Lakota living on the Pine Ridge Reservation, has grown industrial hemp on his land since 2000. That year, the DEA, with helicopters and machine guns, confiscated the crop (legal in the sovereign nation in which it was grown), costing taxpayers more than $200,000.00. In 2001, the DEA came only with side arms and weed eaters, this time simply destroying the crop. In 2002, Alex and his family again planted fields of industrial hemp, but were unable to complete their contract by delivering the crop to the Madison Hemp and Flax Co., because U.S. District Judge Battey (in Rapid City, So. Dak. ), issued a civil injunction stating that if Alex so much as touches his hemp, he will be held in contempt of court and jailed for up to six months without a trial or a jury. As a result, the hemp was cut and piled by people unknown; the pile lying in silent testimony between Alex and the Madison Hemp & Flax buyer Craig Lee, both barred from touching it by the government. Delivery was made, but the deliveree could not accept the product. 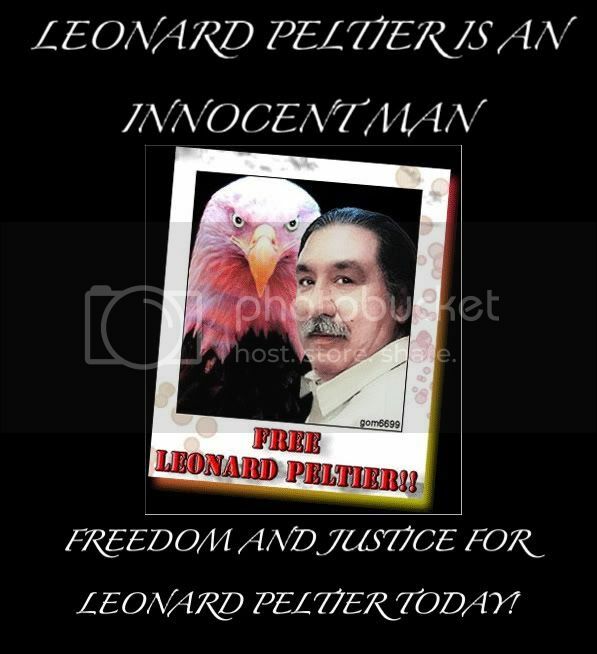 He was and is innocent, and that’s why you should free Leonard Peltier. I have one more question with all due respect – when does it stop? Despite protests of American Indian People and other supporters, the county has granted alcohol licenses to the bars. Recently, a corporation has purchased majority ownership in the bar closest to Mato Paha and they are going to have helicopter rides over the butte. We are informed this corporation is affiliated with or are former Blackwater high clearance mercenaries and have already strong armed some American Indians who were on public land taking pictures. and while he was obviously referring to music; I think it also applies where “victors have been writing the history” - especially since music is a universal language. AIM West, The Leonard Peltier Defense Offense Committee, The Leonard Peltier Support Group of Northern California, POOR Magazine and members of the community demonstrate in front of the Federal Building to protest the assault on Leonard Peltier in the US Penitentiary Canaan in Waymart, PA. Leonard Peltier is an elder, a political prisoner who has been wrongfully incarcerated for more than 3 decades. 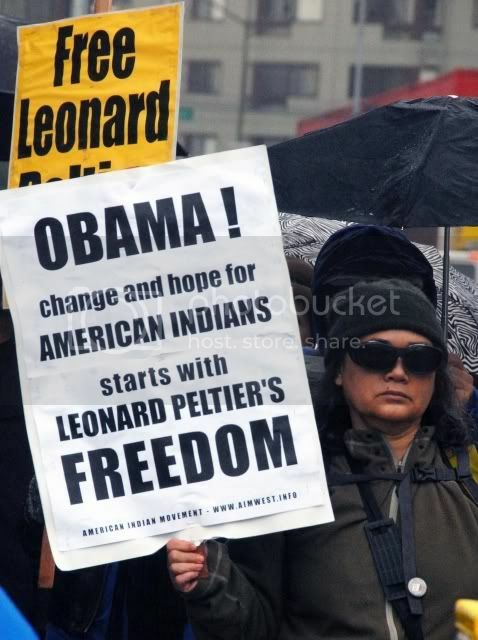 The people demand that he be given proper medical care, nutrition and that President Obama give this the attention it deserves by granting Leonard Peltier his freedom. This one's long overdue. Thanks for raising the issue again. I hope it will bring some attention. Thankyou Ralph and I hope that with you.